In anticipation of our Workshop on Populism and Constitutionalism on 20 November (info & sign up here) we are publishing a series of blog posts in which the speakers will outline their thoughts on the topic. 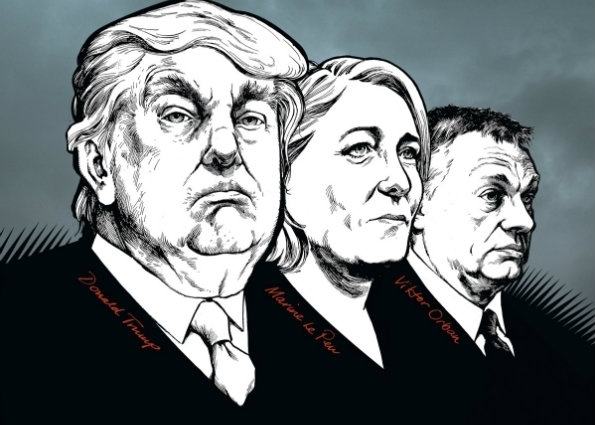 We are continuing our series with a contribution from Théo Fournier, PhD researcher at the EUI, who attempts to delineate a common denominator of populist rhetoric. See our previous post here. Populism is often described by some politicians, academics and media actors as the most significant political disease which threaten our democracies. But what is populism? And can we really identify common characteristics between its different iterations? Does populism even really exist? After all, one can always say that what is called populism is just a natural evolution of history, in same way that sceptics argue that climate change is a natural process. It is indeed hard to imagine that countries with little in common are, at the same time, either seized or threatened by populism. So if populism has been studied for such a long time, do we have a remedy to cure the disease? Yes, more than one, in fact. E. Laclau, for example, argues that the rise of populism is a consequence of the denigration of the masses.2 Taking a similar sociological approach, Pierre Rosanvallon considers social and economic inequalities and political disenchantment as the roots of populist political behaviour. Others prefer to analyze populism as a consequence of institutional flaws embodied in European technocracy 3 or party democracy 4. These conclusions are the proof that populism should not be studied in isolation but rather can be explained as a deviation from democracy. I would like here to develop this idea of an interconnection between populism and democracy a little bit further. More precisely, I propose an all-encompassing definition elaborated in the light of what populism really challenges nowadays: liberal democracy. My main argument is that a very small common denominator can be found between the different types of populism. This denominator is populist rhetoric, directly tied to liberal democracy, not democracy in general. Populism is a political discourse aiming to convince a fictional majority that liberal democracy gives rise to the tyranny of the minorities. Liberal democracy differs from the classic vision of democracy in that it is an equilibrium between the principles of the majoritarian choice and the principles of the rule of law. Ideally, these two elements allow for the development of a balanced political system based on the promotion of the majoritarian choice and the protection of minorities. Institutions reflect this duality as illustrated by the parliamentary power (majoritarian choice) constrained by a constitutional review of the legislative (rule of law). Populist rhetoric is all about a manipulation of these two pillars of liberal democracy. Populism twists this notion into the idea of a unitary and uncompromising majority: unitary because, according to populism, a majority is a single entity which cannot be divided or differentiated, commonly referred to as “the people”, “the nation”, or “the citizens”; uncompromising because, since the majority is defined numerically, the majority of the votes is considered equivalent to non-negotiable political truth. This manipulation leads to a second one, related to the rule of law. Since the majority conveys the one and only truth, there is no longer a place for the rule of law. However, populist rhetoric does not totally erase the rule of law; instead it uses it as a pretext. Populism turns the original equilibrium of liberal democracy into a balance of power in which the majority no longer sits alongside the rule of law, but rather is constrained by it. It transforms the institutional reality into a political myth arguing that the original objective of liberal democracy (the protection of minorities from the tyranny of the majority) has been pursued to the extent that the situation has been reversed: there is now a need to protect the majority from “the tyranny of minorities”. And this protection can only be achieved if the will of the majority takes precedence over the rule of law. Based on this manipulation of the foundational pillars of liberal democracy, populist rhetoric can be defined as political discourse aiming to convince a fictional majority that liberal democracy gives rise to the tyranny of minorities. Checks and balances, accountability and respect of the rule of law are ignored by populist discourse, simply because they are seen as justifying the tyranny of minorities. This conception of populist rhetoric must be compared with the division between rightist and leftist populism. Even if their vision of the majority and their political objectives are different, I want to suggest that the two sides rely on the same populist rhetorical notion of saving the majority from the tyranny of minorities. If there are differences between rightist and leftist populism, these have more to do with the expression of their political program rather than their essence, their raison d’être. They have more in common than the classical division between left and right may imply. I would even suggest that despite being at the two extremes of the political spectrum, the gap between the two is smaller than the one between traditional left and right political parties. Another point of convergence between rightist and leftist populism is the division between populism of opposition and populism of government. This distinction is the reason why many scholars and political figures play down the significance of populism, because they consider it as being a simple force of opposition. During election campaigns, populist political parties cause a stir, occupy media coverage, manage to influence political but without any concrete electoral results. Some might suggest that this ‘glass ceiling’ was apparent in Austria in December, or even in France during the last presidential elections. However, the results in the US and the UK reveal how fragile that ceiling is. Elections are, of course, the first step in the process of governance. The next is much more complicated and some have predicted that, even if populist parties are elected, they will be constrained by binding institutional and political structures and, therefore, will not be able to put their promises into practice. According to this view, long-established liberal democracies, thanks to their mechanisms of checks and balances and division of power, would be per se resilient to any populist form of government. However, this way of reasoning is dangerous and does not prevent a non-democratic obverse. Checks and balances, accountability and respect of the rule of law are ignored by populist discourse, simply because they are seen as justifying the tyranny of minorities. This explains why populist parties (ab)use referendums either to change the constitution or impose non-liberal democratic changes. According to populist rhetoric, the majority is not limited by any rule; it cannot be constrained and especially not by a specific constitutional amendment majority. In any case, a brief look at recent European constitutional history reveals how narrow the gap is between populism of opposition and populism of government and how easy it is for populist ideas to be put into action. Indeed, there is a disturbing tendency for European policies to be influenced by populism of opposition. And even more concerningly, some constitutional amendments have been proposed, and sometimes implemented, as a result of the rise of populism. In the case of the United Kingdom, who can claim that Cameron’s decision to hold the EU referendum was not influenced by the growing influence of UKIP, which was not even part of the shadow cabinet? In France, how can one explain the 2016 constitutional debates about dual citizenship without taking into account the political strength of the Front National? The theorization of populism of opposition and populism of government is, to some extent, accurate. But when it comes to the political reality, this distinction collapses and serves only as a fallacious argument for politicians (and some scholars) who refuse to act in concreto against the spread of populism.